Samantha Heidtmann grew up on a farm in Southold where her father, Tom McGunnigle, grew potatoes and hay. It wasn’t a lavish lifestyle, but one she learned to be proud of. The Community Awareness Program annual “Say No to Drugs March” kicked off in front of Pulaski Street school at 9:30 Friday morning with Riverhead Police Officer Dennis Cavanagh, this year’s honoree and keynote speaker also the Riverhead-News Review’s 2013 Public Servant of the Year, leading the procession with four other motorcycle officers from Southold Town, Sheriff’s Office and Suffolk County Police Department. ROBERT O’ROURK PHOTO | The Stony Brook women’s lacrosse team and assistant coach Caitlin Defliese will travel to Riverhead June 7 for the 28th annual Say No to Drugs March. The nationally ranked Stony Brook University women’s lacrosse team will be the keynote speakers at next month’s annual anti-drugs march in Riverhead. 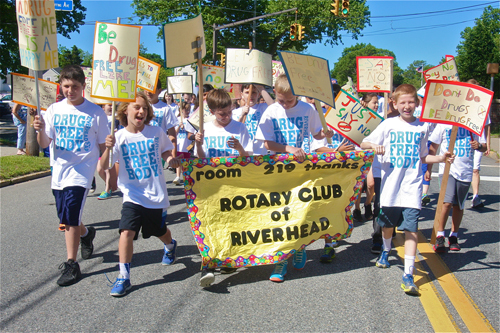 The 28th annual Say No to Drugs March, sponsored by the Riverhead Community Awareness Program June 7, will begin at Pulaski Street School before looping back around through Roanoke, Griffing and Hallett Avenues. The team will speak to students and residents on the steps of Pulaski Street School after the march. The Stony Brook women’s lacrosse team put together a historic season this year, winning a program-best 17 games and going undefeated in conference play. The team went on to win its first-ever America East title. The team won 10 awards, including Demmianne Cook winning Player of the Year. CAP’s executive director Felicia Scocozza said she was “thrilled” to have the team share their experience with Riverhead students and the community. “We hope that members of the community will once again come out and support the students and their efforts to remain drug-free,” said Ms. Scocozza, a Stony Brook alumna.